Think is a free Windows 8 quote app that lets you read different types of quotations extracted from movies, songs, comics, and from real life, written by popular authors. The interface of this Windows 8 quote app is quite easy-to-understand. 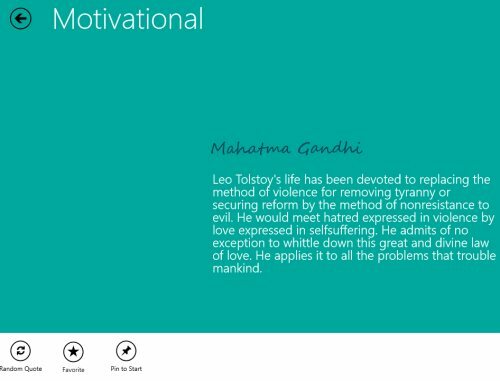 All the quotes are given in live tiles format along with the author name. To read the entire quote, just click over it. You can also pin the app to start so that you can keep reading the quotes without getting started all over again. The quotations have been categorized separately — Motivational, Philosophy, Recents. You can read according to your preferences. And in case you have liked a quote, you can also add it to your “Favorites”. To mark a quote as favorite, simply open the quote?right click anywhere on the screen?From the context menu, click on “Favorite”. Now, if you go back to the main screen, you will find a new category has been created as “Favorite”. similarly, you can mark as many quotes as you want as your favorites. Go ahead and try Windows 8 quote app available under the Lifestyle category of Windows 8 store.